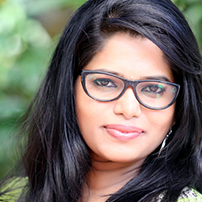 When Karthika Nair first came to Kochi almost a decade back from a remote village in Palakkad, starting a business of her own was far from her dreams. Daughter of a middle class family with her father running a self sufficient hotel business in her home village, her dreams were also focussed on self sufficiency. This dream got a boost when she starter working part time for a public relations company. The boss was impressed with her marketing skills and told her so. Taking this as a huge encouragement, she delved into the field with much eagerness. At the time, her salary was Rs 4000 per month. She started doing marketing work and years later she got an offer from a leading cosmetic brand from Italy who were planning their launch in the country. The product was mainly parlor cosmetics. She was quick to tell them that while she was willing take the job, she needed more information on the product and what it does to skin to do so. Thus she attained international training on cosmetics and is now capable of giving expert advise and consultancy regarding the same. The idea of launching a business of her own rooted in her head when she was marketing the products of the Italian company and came face to face with the lack of professionalism and experts in the skin and hair care field. She was appalled that ‘bleach ‘ which could damage one’s skin forever was used commonly and without any concern for the skin of the customer across the country. This encouraged her to launch a parlour which would aim at providing the best ‘educated’ health care. This was the beginning of ‘ Karthika Professional Beauty Clinic’. At the time she was employed with a salary of Rs. 78,000 and everyone close to her except her family discouraged her. She used all her savings till the date and a loan of Rs 18 lakh to begin her dream venture. Karthika had made all the plans herself and had to work hard for 6 months to make a project that would convince the bank. Her will to succeed made it possible and at the age of 27 she launched her professional beauty clinic at Kathrikadavu in Kochi on June 15 2016. The clinic now also have a franchise at Aluva in Ernakulam which will be inaugurated on February 12 2018.Karthika’s is possibly the only parlour in the state that does not offer bleach. Having worked under many people, Karthika is very much aware of what staff expects from employers and is particular about keeping her staff at ease. Every staff appointed in her clinic has to undergo a 21 day training period. Karthika dreams of more franchises and popularising her motto “healthy skin and hair for a life time”. Recently, Karthika has also ventured into the restaurent business through ‘Le Royale’.